Wow, all I can say is just Wow. When I started reading The Hardest Peace, I really didn't know what to expect. 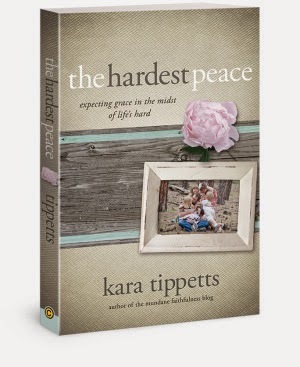 I knew it was about Kara Tippetts and her journey with cancer and about finding grace in the hardest moments. What I didn't expect was for this book to touch me in such a deep way that I am sure I will be thinking about some of the things that she said not only for days, but I imagine (or I hope) for years. If you are looking for an open honest put it all out there book, then The Hardest Peace is the book for you. Kara Tippetts' writing style is very personable. I feel as if I have met her and know her. And from page one she captivated my attention. And I hope through her journey that my life too has been changed as I come to realize the truly important things in life. And I'm also giving away one copy of The Hardest Peace. This is truly an extraordinary book. Please enter using the Rafflecopter below. U.S. Residents only. The giveaway ends October 22, 2014.